The skin consists of three layers, "epidermis", "dermis" and "subcutaneous tissue", and organs such as sweat glands, sebaceous glands, and hair. The outermost stratum corneum protects the entire skin from outside stimulation,ultraviolet rays and keeps moisture. The wax directly touch this important layer.So choosing wax need care same as choose skin care products. La Belle Image use RICA wax that made more than 98% of natural ingredients.It is made from organic plants, fruits, etc at the * Ecocert approved plant in Sicily Island, Italy.No rosin included.RICA wax is trusted as gentle wax to your skin more than 80 countries worldwide. ✽Ecocart: An organization that inspects and certifies whether it meets the organic standards of Europe. Organic cosmetic certification has a global share of 75%, the world's largest organic (organic) certification body. Smoothen and soften your skin.The old keratin of the body will removed with unwanted hair and fresh your skin.By takeing wax repeatedly,turnover cycle of the skin is also well-regulated. 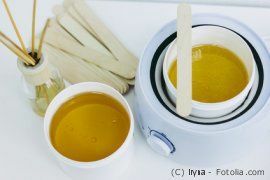 Take waxing not only summer season and special event,It help your skin healty if you take wax as reguler routine. ✽Skin after wax is delicate. Please use sunscreen to prevent sunburn. ✽Following treatment will be after 3 to 4 weeks later. Face wax is not only epilation effect, it also makes it smooth, moisturized skin as after peeling.100% natural sugar wax made with water, sugar and lemon extract and avocados hard wax that rich in vitamins A, D, E nutrition to your skin,remove hair and dead celles.Try wax in a place that is not noticeable, and check reddish appeared or not on your skin.After waxing, skin-tone brighter and makeup sits well. ✽Following treatment will be after 3 to 4 weeks later.Recommend facial wax every season (about 3 months). ✽Underage, pregnant can not be accepted. It is no problem to take wax during menstruation, but it tends to be sensitive of situmilation to feel pain and get reddish easier. ✽Unlike permanent hair removal, wax depilation does not mean hair does not grow out. ✽If the hair is too short, wax will not get caught in the hair, so it may not be processed or some hair will be lefted.For thick and hard hair such as underarm's hair need to be 8 mm to 1 cm, for other parts need about 5mm. ✽It involves some pain. I use hard wax for thick parts and sensitive parts such as under arm, nape and face for less pain. ✽If you have any infectious diseases, warts, herpes, shingles, pimples, rough skin, rash, extreme drying may be refused to accept. ✽If your skin have irritation,sunburn, peeling and after laser teatment, please wait until skin returns to normal condition.Also, you can not receive wax and any facial treatment on the same day. ✽Disinfect before and after wax. Because alcohol is contained, person who have an allergy of alcohol can not be accepted. ✽Avoid bathing on the day after waxing, please rinse with a shower. If you touch it with a dirty hand it will cause trouble with germs. ✽Your skin after waxing is sensitive. It is important to prevent skin troubles and buried hair by keeping cleanliness and moisturizing. Recommend using disinfection and moisturizing oil with less irritation used in the salon. Please inquir. ✽Avoid using pablic baths, spas, saunas, pools, and going to the sea and sunburns about three days. ✽Even if most people can use it without problems, some people may cause contact dermatitis and allergy. If your skin is sensitive, worried about allergies or have some disorder, please consult your doctor before wax. ✽If you are thinking about hair removal for an important scene such as a wedding,please take wax once at least 1 month ago, and check your skin is fine with wax.